If you’re letting out a heavy sigh at the title, I’m right there with you. Rise of the Tomb Raider, it’s been confirmed in an interview, will feature microtransactions in the form of Expedition Cards which offer “hundreds of ways” to modify the game. Some of these are silly, some of them are cosmetic, but others have an actual effect on gameplay, specifically in the leaderboard modes. While the cards are also earnable in-game, with over 300 of them according to this interview with Xbox Wire, you’re unlikely to get the ones you want from the packs you buy. The cards come in two forms, more powerful Foils and more, uh, common Commons. Foils are multi-use, while commons are one-and-done. They’re a key part of the newly announced semi-multiplayer mode called Remnant Resistance. This allows you to craft your own custom objectives within the game’s hub areas and race to see how quickly and stylishly you can complete them, with a point total increased by performing kills and grabbing collectibles quickly. You can then share your mode with friends, letting them try it. Mercifully, if you use any Expedition Cards for this, they will also be shared with your friends, free of charge. Specific cards mentioned were Big Head Mode and Bullet Resistance. While the latter is obviously more egregious, the impact of the former being locked behind paid-for and randomly assigned cards is a sad reflection of where games have got to. What was an unlockable, fun if simple secret in the late 90s is now yet another thing to open your wallet for. I don’t even particularly object to this idea of in-game currency and random upgrades, but letting them be paid for puts a different slant on how they’re earned and used. Titanfall had a very similar system, but the Burn Cards weren’t purchasable and became a fun part of gameplay rather than a frustrating one. 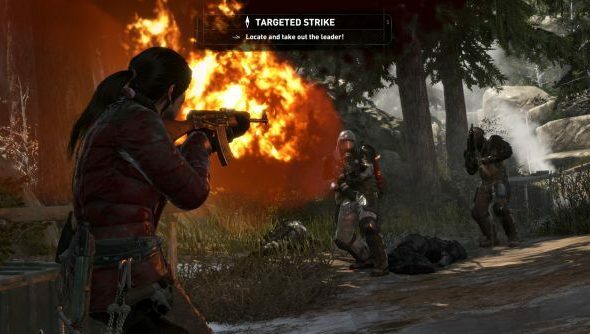 Plenty more on Rise of the Tomb Raider’s multiplayer and other options in the full interview. It’ll be some time before the game reaches our motherboard-shores with the Xbox exclusivity deal in place, so it’s possible not all these features will make it.